As far as anyone knows (Ville included) there are no in-game cheats. There are also no third-party trainer/savegame editor programs. However, it is fairly easy to edit your save file. Just open it up with notepad. As far as anyone knows (Ville included) there are no in-game cheats. There are also no third-party trainer/savegame editor programs. However, it is fairly easy to edit your save file. Just open it up with notepad. hey i opened up my saved game in notepad like u said and found the part where all the ships are listed, what do i change it to to make it so i have really strong ships. (the strongest i know of are the navy vessels so far)! hey i opened up my saved game in notepad like u said and found the part where all the ships are listed, what do i change it to to make it so i have really strong ships. (the strongest i know of are the navy vessels so far)! what? Was that an answer? what? Was that an answer? I made a trainer for the game and thought I would let others know about it. If for nothing else the infinite fuel cheat is worth the download. 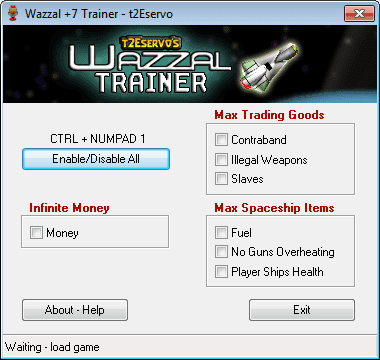 My trainer has 7 cheats available (two cheats which apply to all 6 player ships). Good job. You also seem to be very savvy on the subject too. I'm impressed. :o Good job. You also seem to be very savvy on the subject too. Good job. You also seem to be very savvy on the subject too. Thank you for the kind words. I am still learning, I just share what I learn/know about the topic on my website as I go. [quote=postid_284001]I'm impressed. :o Good job. You also seem to be very savvy on the subject too. [/quote] Thank you for the kind words. I am still learning, I just share what I learn/know about the topic on my website as I go. Just posted it on the blog. Just posted it on the blog.